In most of my presentations when I discuss why I started Aussie Heroes I talk about situations like this. Whenever or wherever they are needed, our Defence Force members are there to provide services and assistance. Thank you to all of you who have deployed to the areas affected by Cyclone Debbie. We are so grateful for your service and the sacrifices that service asks of you and your loved ones. and now for some more gratitude. Abby N Jack received this photo recently from one of her grateful recipients. I am so excited right now. I’ve just received both the laundry bag and quilt in my mail today and they are just wonderful. I got goosebumps opening them. I LOVE THEM. Thank you so much for putting the time into making these and they are just what I wanted. You had no idea of knowing, however elephants and giraffes are my absolute favourite animals and was loving that they were included. I was lucky enough to have seen a massive herd of elephants on a 3 day safari in Uganda. I’m still over here for another 6 weeks and counting down the days now. I have two little boys, 6 and 8, who I miss like crazy and can’t wait to wrap myself up in them again. Once again, thank you for your amazing work. The effort that goes into these items is certainly not unnoticed and the members who receive them just love them.. I know I certainly love mine. What a lovely quilt, my bed is going to look pretty amazing and will be loved forever. It is great to see how many families have been, or are still involved with defence life. It's values are great to add to our growing childrens' lives. My stepson has just joined Army Cadets while I have been here, and already feels the camaraderie of the crew he is with. I have lived in many areas of NSW in my life and for a while lived in Grafton, a bit further north and northern NSW is a very beautiful part of Australia. I have saved your location and details and next time we head that way it would be a delight to drop by and say hello to your caring organisation. Thank you so much for the laundry bag, it is absolutely amazing! It must have taken a tremendous amount of time to sew. I cannot imagine what you were thinking about when you were putting this one together. So many people are amazed that we could give up Canada to become Australian. In reality, it was a very simple decision – and as I remind people, I am the happiest Australian you will meet today. I have long admired Aussie Hero Quilts and have seen the quilts and laundry bags. I have also often wondered what kind of people take so much of their own time to sew these things for people they have never met and will likely never meet. Your letter told me everything. You are a person who obviously takes pride in what we do and you care about people. For your pride and caring – thank you. I have actually been an Australian for nearly fifteen years and this is my fourth tour in the Middle East. My family and I certainly believe our country and our people are worth the sacrifices we must make in order for me to do this. I consider it a great privilege to serve my county but, alas, my time is coming to an end. Counting my service in the Canadian Army as well, I have now done forty years with over four years of overseas operations. Your laundry bag will be a treasured memento of my service and something I will always treasure. You did a great job, and its very comfortable :) I like solid colours ...it's a bloke thing and I am sure it will get frequent use in my "man cave" (the front lounge room) during the footy season whilst curled up on the lounge watching the footy. It is always quite amazing and heart warming how many people in Australia remember Australian Forces overseas especially over the Christmas period. A bit about me ....I have served with the Navy firstly as Quartermaster Gunner for 6 years, and then changing branches to a Naval Police Coxswain. All up I have served for 26 years (I had a three year break mid life and went exploring). In the last 14 years I have spent just over 10 years at sea on various platforms around Australia and this trip being 9 months to the Middle East will be my longest away from home. I am very fortunate to be married to a very caring and understanding lady, and we don't have children. I know the guys and the girls will be having a photo with our quilts sometime in the future and I am sure it will make it's way to Aussie Hero quilts. Thanks again for my West Coast quilt , hopefully the Crows will have a good year as well. Keep up the lovely work that you do , it is appreciated. 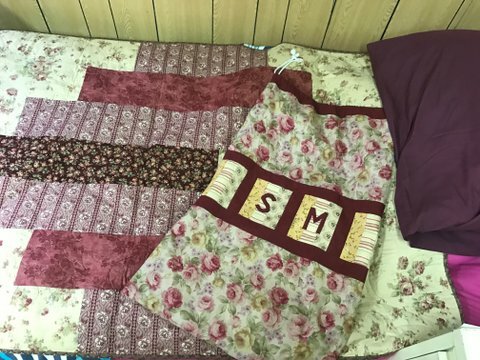 I wanted to write to you to say thank you very much for the quilt and laundry bag that you created! They are both amazing and I cannot even comprehend how you can make these things! I do actually like the bits of pink you worked into the quilt and laundry bag. I am surrounded by girls at home (wife, and two daughters 5 and 3.5), so it is a nice reminder of them. They do have the hard job of keeping going while I disappear time and time again. I am sure the quilt will be dragged out almost daily at home for cubbie houses, picnics (of the teddy bear kind), story times and even when the girls tire out and fall asleep on the couch after being at the beach. Finally I wanted to say the work that you guys do really is appreciated over here. These packages really help give a morale boost and treasured items ever after. And it is really a weird sight to see groups of dirty, tired soldiers standing around admiring patterns and stitching! Thanks again Joy, you are a gem. Another day down and another day closer to coming home. But what made today that little bit sweeter was the arrival of my BEAUTIFUL quilt from Aussie Hero Quilts. The quality of the stitching and quilting is excellent! yourself, Deanna, Judy and Jeff are very talented. Please, pass on my sincere thanks and love to all that had part in making it. Rest assured that your efforts do not go unnoticed - we are so blessed to have people thinking about us back home and willing to put in their time, effort, skill and materials to create such a special gift. The quilt covers my single bed perfectly and I have had many comments on how gorgeous people think it is. I am spreading the word about your good work over here. I have included some photos - please feel free to use them however you like. I received my laundry bag today and I would like to thankyou for the gifts and book it is muchly appreciated. I would also like to thankyou for your time and effort you are in making these for laundry bags for us. I would firstly like to say thank you SO SO much for my gorgeous quilt, laundry bag and pillowcase. I have to say,I felt a bit spoilt getting all three! They are absolutely perfect. I walked around the ship for a while when I received them, wearing my quilt as a cape (lol). I love pink and I love horses so it is wonderful. Thank you again Sarah, for your gift to me and to the rest of the amazing quilt makers around Australia. It makes our day out here getting the packages and seeing what wonderfully work has gone into making us something so very special that we will cherish forever. I received a laundry bag created by you and I would like to send my thanks. I am currently working with the USAF. 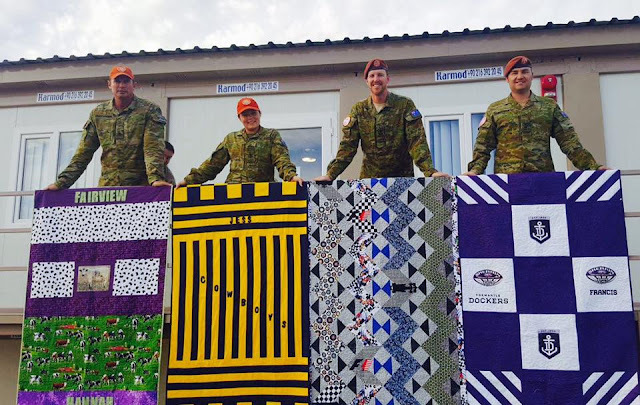 Many of the Australians here in Afghanistan have received quilts and Laundry bags. Once again thank you very much for the laundry bag. 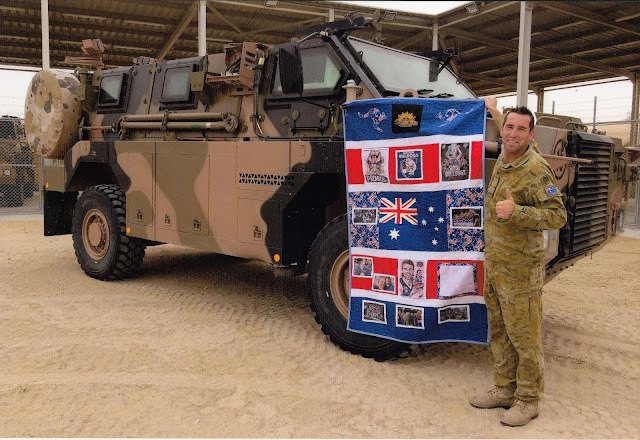 I was happy to have recently received one of your Aussie Hero Laundry bags Whilst being deployed with the RAAF. I would just like to say thank you for making and sending it and let you know that I’m finding it very useful and it also makes me happy to know people in Australia don’t forget about us while we are gone. I’m close to going home now, in my 7th month away, and I’m really looking forward to getting back on home soil. It has been difficult to be away from my family, my 2y.o. son and my wife (who is weeks away from giving birth to our 2nd son), have been missing me and I’ve been missing them too. I have been proud to be here and playing my small part in the bigger picture though. Till next time..... keep spreading the word and happy stitching! Awesome thankyou's, we love 'em! !